GEN Wrapped Cutlery Kit. Wrapped cutlery kit. Wrapped for sanitary dispensing. All-in-one packaging.Break-resistant plastic.Ensure sanitary dispensing with individually wrapped utensil combos. All-in-one packaging streamlines order preparation and cafeteria line movement. Break-resistant, medium-weight plastic. 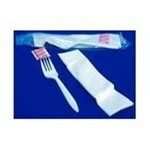 Includes 500 individually wrapped kits containing a fork, napkin and packet of salt.